SAN FRANCISCO – (AFP) – The US Agency for International Development and the Swedish government announced a $25 million grant program Monday to increase access to clean water for farming. The Securing Water for Food program is intended to fund innovators and help their businesses take root in countries where the technology is desperately needed. 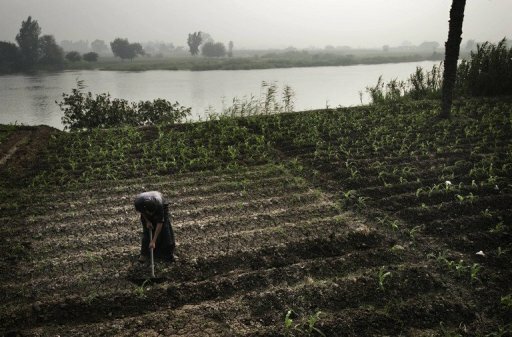 “Almost three billion people on the planet right now live in areas impacted by water scarcity,” USAID Global Water Coordinator Chris Holmes told AFP. Grants were expected to range from $250,000 to a million dollars for winning proposals. “It is not just putting up cash; it is making a commitment that we will work closely with them to overcome obstacles in a developing country to try to build out a new technology,” Holmes said. Grants will be awarded in categories such as improving water reuse and countering intrusion of salt water into rivers, streams, deltas or underground aquifers. “In a finite biosphere, solutions to pressing water challenges require new thinking and innovative financing,” Swedish Minister for International Development Cooperation Gunilla Carlsson said in a statement. Water scarcity affects more than 40 percent of the world’s population, and approximately 70 percent of fresh water is used for agriculture, according to USAID. “Water scarcity and its impact on food security affect everyone on the planet,” said USAID Administrator Rajiv Shah. USAID and the Swedish International Development Cooperation Agency will begin accepting grant proposals in early November. Information about the challenge grant program was available online at securingwaterforfood.org.